Sometimes a person’s organs stop functioning for various reasons. While such incidents are deadly for some people, they also offer another person or persons a chance to live. But, everything depends on how generous you are. Saving another person’s life is the highest merit or the best deed one can achieve or perform according to his or her religious beliefs, ethics or values. A Memorandum of Understanding (MoU) was signed for the project of transplanting kidneys and other organs of patients who are brain-dead, to patients who need new organs, at the President’s Office, under the patronage of President Maithripala Sirisena recently. The MoU was signed between the Health, Nutrition and Indigenous Medicine Ministry and the Sri Lanka Air Force (SLAF); Health, Nutrition and Indigenous Medicine Ministry Secretary Wasantha Perera and Defence Ministry Secretary Hemasiri Fernando signed the document. The agreement was signed to establish an efficient system for the transportation of organs. 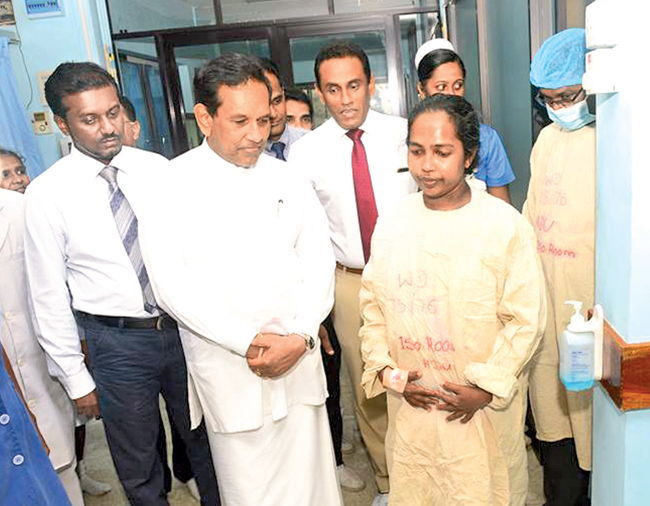 Health Minister Rajitha Senaratne with the patient who underwent heart transplant surgery. Under the supervision of the President, the Presidential Task Force on Prevention of Chronic Kidney Disease in collaboration with the Health, Nutrition and Indigenous Medicine Ministry, had initiated a kidney trasplant project at the Kandy Hospital. This project has now been expanded to the transplant of other organs such as liver, stomach, eyes and cells. Five to six people die due to road accidents every day and this project works on transplanting the healthy organs of those dead people to patients who are in need. The bodies of persons who die due to accidents should be promptly taken for removal of vital organs. 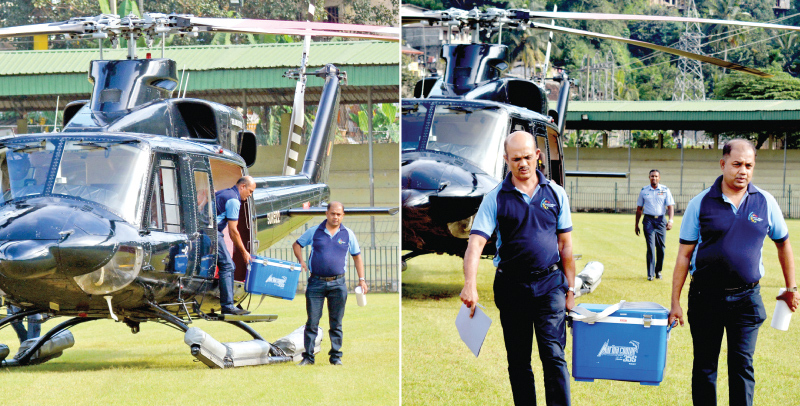 Therefore, the Sri Lanka Air Force has agreed to transport them quickly to hospitals. The payments are made by the National Kidney Trust Fund established by the President. Plans are underway to extend the gratitude of the government at the funerals of brain-dead persons who donate their organs. Usually, a heart should be transported to the theatre where the transplantation takes place half-an-hour earlier and a liver should be transported three hours earlier. One brain-dead person’s organs can save the lives of several patients. According to Health Minister Rajitha Senaratne, around 400 kidney transplant surgeries have been performed under the yahapalana government. Only five leg transplants were conducted in the world, and four of them were unsuccessful. Only the leg transplant which was performed in Sri Lanka was successful. A cochlear implant surgery worth Rs. 3.6 million is now available free for local hearing-impaired children. Bone marrow transplant surgeries are also available free. Earlier, these surgeries could only be performed abroad, so children from low-income families were at a disadvantage. 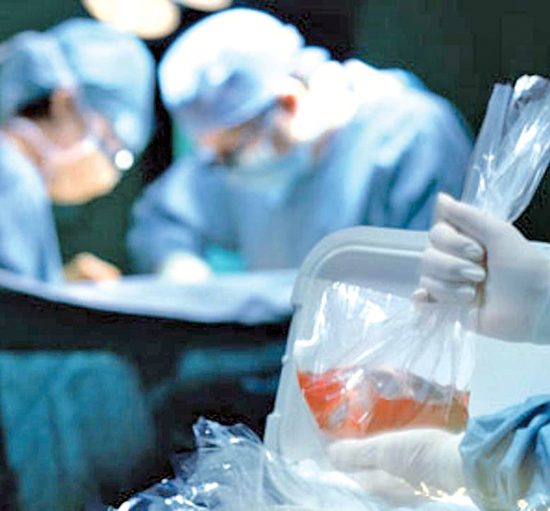 Minister Senaratne said organ transplant surgeries were limited in the country before 2015, and only 40 kidney surgeries were done but in 2017, 400 kidney transplant surgeries and 70 liver transplant surgeries were performed. Ninety-five percent of them were successful. Now pancreas transplant surgeries are also performed in Sri Lanka. For some patients, more than one transplant surgery has been conducted. A new 17-storey kidney transplant unit will be constructed at the National Hospital of Sri Lanka (NHSL). Currently, organ transplantations are conducted in Anuradhapura, Kandy and Peradeniya state hospitals. Rules, regulations and laws related to organ transplantation in Singapore will be studied and introduced to Sri Lanka, if they are suitable for us. The government is taking all steps to ensure that organ trafficking does not happen. The first heart transplant surgery which was conducted in Sri Lanka, was successful and the 34-year-old woman who received a new heart leads a healthy and happy life today. She underwent the surgery at the Kandy General Hospital on July 7, 2017, and the Health Minister visited her recently. The Health Ministry had provided her special facilities including an air conditioner for her house for her to be able to maintain good health after the surgery. The donor was a 24-year-old brain-dead male patient and his kidneys were transplanted to two kidney patients who were waiting to receive kidneys. The cadaveric donor or deceased donor for kidney transplantation system was officially launched in Sri Lanka in March 2016. Since then kidney donation has been done legally in a methodical manner which assists a large number of patients who are waiting to receive kidneys. Now, any Sri Lankan can fill a simple form and declare his or her consent to donate kidneys if he or she dies suddenly. A special membership card will be issued after the filled form is handed over to health authorities. The next of kin can also give his or her consent on behalf of a person who is declared brain-dead after an accident. Two doctors including a specialist have to certify that the person is brain-dead. One kidney donor can save two lives. Any Sri Lankan who is above 18, and who does not have any obvious kidney problem and infectious diseases such as HIV and hepatitis B or C, can give prior consent to donate kidneys after his or her death. The harvested kidneys are transplanted in two patients in the last stage of kidney failure with the compatible blood group. Each of them will receive one kidney. Organ transplantation is a medical procedure in which an organ is removed from one body and placed in the body of a recipient in place of a damaged or missing organ. The donor and the recipient may be at the same location, or organs may have to be transported from the donor’s site to another location. Organs that have been successfully transplanted include the heart, kidneys, liver, lungs, pancreas, intestine and thymus. Kidneys are the most commonly transplanted organs worldwide, followed by the liver and then the heart. The consent of persons to donate their organs will be included in the new driving licence. The required legal work in this regard has already commenced. Once the consent of the driver to donate his or her organs is included in his or her driving licence, it will be easier for medical staff to carry out the donation process. People who wish to donate their organs can contact the Kandy General Hospital’s Organ Transplantation Coordination Centre on 081 2226522. When someone is declared brain-dead, it means that the brain can no longer work in any capacity and never will again. Other organs, such as the heart, kidneys or the liver, can still work for a short time if breathing is artificially maintained. But, when a person is declared brain-dead , it means that the person has died. The heart will beat for some time after the brain dies, as long as breathing is artificially maintained as heart function does not entirely depend on the brain.